Note: The following is excerpted with permission from the CatechismClass.com 5th Sunday after Easter lesson. 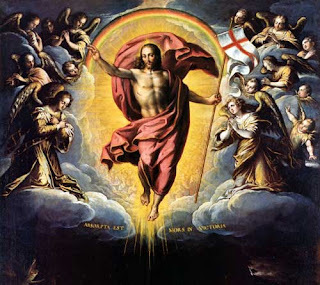 As we celebrate our Lord’s Resurrection from the dead, we choose today to turn our attention to understanding the important difference between the Catholic belief in a resurrected body and the false principle of re-incarnation. According to re-incarnation, all peoples receive a new body after death; thus, the body that a person has now is not the body that he will have in the future. Believers in reincarnation directly contradict the Creed which professes a resurrection of the same body that a person currently possesses. Our Lord’s example shows forth to us a model since we are to follow Him in His Passion, Death, and Resurrection (of the same body!) since He Himself has foretold it (cf. John 13:36). Christ did not inherit a new body. Christ’s body in Heaven still bears the same wounds from the Cross. It is for that reason that St. Thomas was told by Christ to put his hand into the Sacred Side of our Lord so that Thomas would believe in the Resurrection (cf. John 20:24-29). Christ rose from the dead in the same Body! But for reasons aside from our Creed, reincarnation is unacceptable for purely philosophic reasons. Succinctly put, the substance of something is what that thing properly is. Let’s take a chair for instance. There are leather chairs, wooden chairs, three-legged chairs, four-legged chairs, recliners, et cetera. What makes all of these a chair? A chair is a substance and all of these manifestations share in the quality of “chair-ness”. In this sense, we see that something is not defined by its accidents (i.e. “any contingent, or nonessential attribute” – Catholic Encyclopedia). Even if I took a dining chair and broke its legs, painted it, and threw it outside in the dumpster, it would still be a chair (albeit a poor quality one!). I answer that, The assertion "the soul is man," can be taken in two senses. First, that man is a soul; though this particular man, Socrates, for instance, is not a soul, but composed of soul and body. I say this, forasmuch as some held that the form alone belongs to the species; while matter is part of the individual, and not the species. This cannot be true; for to the nature of the species belongs what the definition signifies; and in natural things the definition does not signify the form only, but the form and the matter. Hence in natural things the matter is part of the species; not, indeed, signate matter, which is the principle of individuality; but the common matter. For as it belongs to the notion of this particular man to be composed of this soul, of this flesh, and of these bones; so it belongs to the notion of man to be composed of soul, flesh, and bones; for whatever belongs in common to the substance of all the individuals contained under a given species, must belong to the substance of the species. It may also be understood in this sense, that this soul is this man; and this could be held if it were supposed that the operation of the sensitive soul were proper to it, apart from the body; because in that case all the operations which are attributed to man would belong to the soul only; and whatever performs the operations proper to a thing, is that thing; wherefore that which performs the operations of a man is man. But it has been shown above (Article 3) that sensation is not the operation of the soul only. Since, then, sensation is an operation of man, but not proper to him, it is clear that man is not a soul only, but something composed of soul and body. Plato, through supposing that sensation was proper to the soul, could maintain man to be a soul making use of the body. Thus, on both purely religions and purely philosophical grounds, valid arguments are raised against reincarnation. For those of us faithful to the Traditions of the Church, it behooves us to learn the future of our own bodies. We know that we shall rise again in a glorified body but what is a glorified body? What does it look like? How does it function? We now turn to understanding this point. In addition to this, the bodies of the risen Saints will be distinguished by certain transcendent endowments, which will ennoble them far beyond their former condition. Among these endowments four are specially mentioned by the Fathers, which they infer from the doctrine of St. Paul, and which are called gifts. The first endowment or gift is impassibility, which shall place them beyond the reach of suffering anything disagreeable or of being affected by pain or inconvenience of any sort. Neither the piercing severity of cold, nor the glowing intensity of heat, nor the impetuosity of waters can hurt them. It is sown says the Apostle, in corruption, it shall rise in incorruption This quality the Schoolmen call impassibility, not incorruption, in order to distinguish it as a property peculiar to a glorified body. The bodies of the damned, though incorruptible, will not be impassible; they will be capable of experiencing heat and cold and of suffering various afflictions. The next quality is brightness, by which the bodies of the Saints shall shine like the sun, according to the words of our Lord recorded in the Gospel of St. Matthew: The just shall shine as the sun, in the kingdom of their Father. To remove the possibility of doubt on the subject, He exemplifies this in His Transfiguration. This quality the Apostle sometimes calls glory, sometimes brightness: He will reform the body of our lowness, made like to the body of his glory; " and again, It is sown in dishonour, it shall rise in glory. Of this glory the Israelites beheld some image in the desert, when the face of Moses, after he had enjoyed the presence and conversation of God, shone with such lustre that they could not look on it. This brightness is a sort of radiance reflected on the body from the supreme happiness of the soul. It is a participation in that bliss which the soul enjoys just as the soul itself is rendered happy by a participation in the happiness of God. Unlike the gift of impassibility, this quality is not common to all in the same degree. All the bodies of the Saints will be equally impassible; but the brightness of all will not be the same, for, according to the Apostle, One is the glory of the sun, another the glory of the moon, and another the glory of the stars, for star differeth from star in glory: so also is the resurrection of the dead. To the preceding quality is united that which is called agility, by which the body will be freed from the heaviness that now presses it down, and will take on a capability of moving with the utmost ease and swiftness, wherever the soul pleases, as St. Augustine teaches in his book On the City of God, and St. Jerome On Isaias. Hence these words of the Apostle: It is sown in weakness, it shall rise in power. Another quality is that of subtility, which subjects the body to the dominion of the soul, so that the body shall be subject to the soul and ever ready to follow her desires. This quality we learn from these words of the Apostle: It is sown a natural body, it shall rise a spiritual body. These are the principal points which should be dwelt on in the exposition of this Article. But in order that the faithful may appreciate the fruit they derive from a knowledge of so many and such exalted mysteries, it is necessary, first of all, to point out that to God, who has hidden these things from the wise and made them known to little ones, we owe a debt of boundless gratitude. How many men, eminent for wisdom or endowed with singular learning, who ever remained blind to this most certain truth ! The fact, then, that He has made known to us these truths, although we could never have aspired to such knowledge, obliges us to pour forth our gratitude in unceasing praises of His supreme goodness and clemency. Another important advantage to be derived from reflection on this Article is that in it we shall find consolation both for ourselves and others when we mourn the death of those who were endeared to us by relationship or friendship. Such was the consolation which the Apostle himself gave the Thessalonians when writing to them concerning those who are asleep. Again, in all our afflictions and calamities the thought of a future resurrection must bring the greatest relief to the troubled heart, as we learn from the example of holy Job, who supported his afflicted and sorrowing soul by this one hope that the day would come when, in the resurrection, he would behold the Lord his God. The same thought must also prove a powerful incentive to the faithful to use every exertion to lead lives of rectitude and integrity, unsullied by the defilement of sin. For if they reflect that those boundless riches which will follow after the resurrection are now offered to them as rewards, they will be easily attracted to the pursuit of virtue and piety. On the other hand, nothing will have greater effect in subduing the passions and withdrawing souls from sin, than frequently to remind the sinner of the miseries and torments with which the reprobate will be visited, who on the last day will come forth unto the resurrection of judgment.